Edwardian Ball "Stories of Gold"
The Midwayville proposed a performance concept to the Edwardian Ball producers that was ambitious: a road of trade that extended between multiple worlds and yet was outside of them. We dubbed it The Athernium Road and further proposed that it had those who were lost, and those who conducted trade on it and the worlds that it linked. 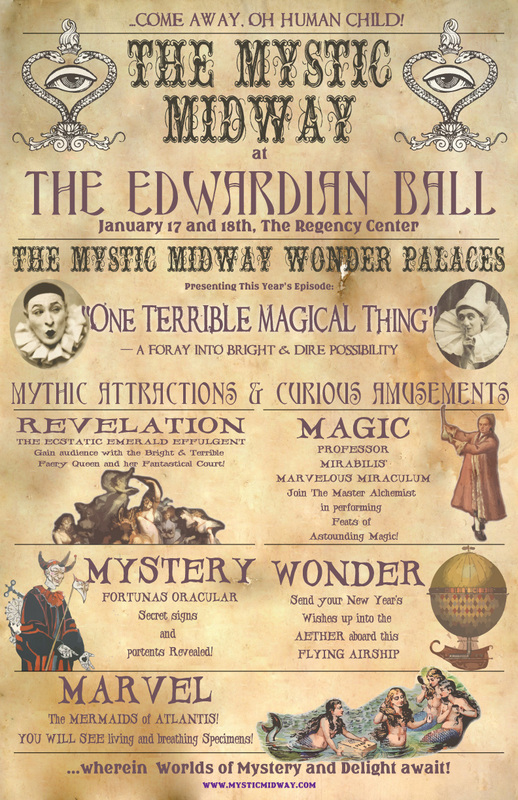 The Edwardian Ball would be one of the stops that these beings made on their journey, and the mortal guests attending the Ball would be treated to a terrible, magical and whimsical collection of visitors who had agendas of their own. The ensemble of performers trained for weeks to learn to embody their characters and learn to use the custom game currency to elicit deep inquiry from guests. During the performance a Goblin Market operated as the locus of the game economy, enabling guests to earn souvenir trinkets through their storytelling. Details: Winter. San Francisco Regency Masonic Hall Theater. Two nights of 4,000 guests total. 35 cast and crew. Booths, sets and stationary interactives, small stage shows, large finale stageshow, variety, walkaround, stilts, and musical performance. Custom paper currency and game economy with locally made souvenirs.